Santander has a branch at City located on Level 1, Drysdale Building in Northampton Square. The branch has recently been upgraded to incorporate a cash counter within its facilities. Adam Cheyne, Branch Manager is happy to assist staff and students with their banking needs. The team at Santander takes customer service as a priority and welcomes anyone looking to take advantage of their products, some of them tailored especially for the City community, such as current accounts for both UK and international students, or mortgages with exclusive rates for City staff. Santander Universities Global Division was born in 1997 with the aim to support higher education as a means to contribute to the development and prosperity of society. Today, over 1,040 universities in 20 countries are members of the Santander Universities network. 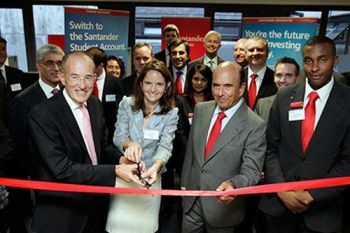 Santander began its UK activity in 2007 and since then has signed agreements with over 60 universities. Through these agreements Santander provides funding for scholarships, mobility grants, special projects and non-academic achievement awards. Since first partnering in 2007, Santander and City, University of London have developed a very close working relationship, which has been of great benefit to City and its students. Every year, Santander offers a generous range of undergraduate and postgraduate student scholarships across all of City's academic Schools. As part of a commitment to investing in charitable causes, the City, University of London branch of Santander will offer to match any monies raised by students up to the value of £3,500, depending on the number of participants. The chart below provides further details. Santander has accommodated a number of City's talented students into the Santander Internship Programme and Summer work placements, giving students the opportunity to gain real experience from working with top professionals in the industry. Students at City are also eligible to take part in the Santander Entrepreneurship Award, which gives successful applicants cash prizes of up to £25,000, as well as access to the bank's expert commercial services to help set up proposed new businesses. For more information on what Santander can offer city students, visit the Santander Universities website, or the Santander Students Facebook page. City is a selected participating institution in the Santander Mobility and Formula Scholarship Schemes. Applying to a masters course? You may be eligible for a Santander Scholarship.